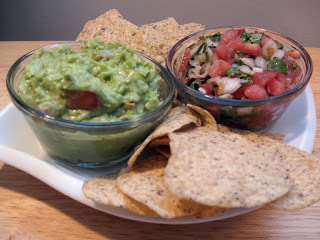 Guacamole has got to be the ultimate dip. Even better than hummus. Who doesn't like the creamy buttery texture of an avocado? Though, the best part of an avocado is the texture and not the taste. So make sure you mix some wonderful flavours into it. 1. Mash avocados with a hand masher, or a fork if you don't have one. Or any blunt object would do. Mix in chopped tomatoes, red onion, and crushed garlic. Sprinkle with salt, and squeeze in some lemon juice. You can also use lime juice, I just find lemon isn't as bitter and is a little more sweet. Stir the works altogether. 2. Chop tomatoes, white onion, cilantro, and jalapeno (chop it really tiny). The jalapeno is optional for some heat. Mix in a bowl. Sprinkle on some salt and pepper. If you want, you could add some oil and vinegar too it. But I think this way is much more fresh tasting.